Rent a luxury villa in Marbella, hire a large apartment in Malaga, or stay in a holiday villa in Nerja to enjoy a holiday on the Costa Del Sol. 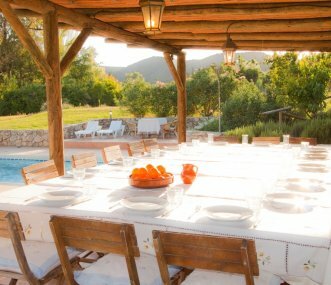 Head inland to rent a villa or farmhouse cortijo in Ronda or a traditional Spanish finca in Arcos de la Frontera, two of Andalucia's pretty white hilltop towns: Los Pueblos Blancos. Many of our holiday villas in Andalucia have a private pool and stunning views, making them the perfect base for a relaxing group villa holiday in the sun. The region is famous for its beaches and also offers excellent horse riding and pony trekking, or excursions to the Andalucian cities of Granada, Seville, Cordoba, or Malaga.